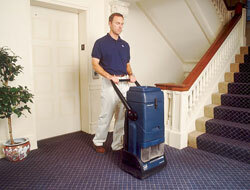 HOST is the leading dry extraction carpet cleaning method. HOST is recommended by carpet manufacturers and fiber producers worldwide. HOST is used daily to clean high traffic areas in airports, restaurants and hospitals, so imagine how well HOST can clean your carpets at home! Advanced Formula HOST Sponges Carpet Cleaner is a soft, natural product that is environmentally friendly. HOST Cleaner is a soft, natural product moistened with water, detergent and a small amount of safe-to-use-solvent. The HOST Sponges Cleaner dissolves, absorbs and traps soil, spots and odors as it cleans, and is removed by vacuuming. Your carpet is clean, dry and ready to use and enjoy right away! Matted carpets are revived and once again become soft to the touch.